Whenever my regular Fringe plans get derailed (like I get shut out of a sold out show), or I just have a hole to fill in my schedule because I can’t figure out what to do and/or everything I really wanted to see just doesn’t happen to be playing at that hour, I default to dance. Fringe season is the one time I get to consume all different kinds of dance - local and visiting artists, classical, modern, experimental or some other hybrid. Good dance will feed and challenge my brain in a way that other live performance sometimes can’t. I don’t have any kind of a background in dance. I owe my affinity for dance at Fringe time to the dearly departed (and still much missed) John Munger. The man understood dance, he took great joy in dancing himself, and even greater joy in sharing his love of dance with others. And he was so welcoming and friendly that he made dance seem more accessible and less forbidding as an art form. So when I was suddenly thrown off my usual schedule the other day out Fringing, I remembered there was a dance show nearby, and I headed over to see that. It was an of town company, and they were just arriving, starting late in the festival schedule. So I figured they could use the audience members. The group is Theory of Dance. 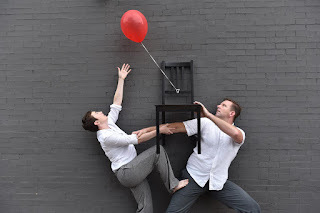 Their show is called Theory of Relativity, with a subtitle explaining “A dance show that explores the physics of our daily routine and relationships.” OK, I’m game. And man, that first few minutes, called “Nebula,” set to the music of the Prague Philharmonic playing “Arrival of the Birds” - I sat there thinking to myself, “Oh, John Munger would have loved this.” In semi-darkness, the company of six dancers (Megan Beseth, Chelsea Branch, Mike Ford, Jessica Kick, Kate O’Hanlon, and Emma Reeves) was split up thusly - one was sitting in a straight-back wooden chair painted black, and from the back of that chair rose a single red balloon, on a long red ribbon. There was one dancer in the center on the floor in front of the chair, and the other four arranged around her. All the dancers had flashlights. First the one in the center and then all those around her began to move, their bodies and their flashlights swooping through the space and the dark in ever expanding circles. The combination of the dancers and the music and the light and dark and that single person sitting under the balloon, it was delightful. The whole show was almost worth that opening number. But not quite. Because everything that happened after that opening moment just had me scratching my head. There still wasn’t anything wrong at all with the dancers. Everyone moved well, individually and together. It was the combination of unfortunate choices of music, unfortunate choreographic choices, and just a strange use but non-use of audience participation. The promise of the opening number just evaporated. Audience participation - this consisted of inviting an audience member to come onstage and sit in the black chair with the balloon, which they would reposition to a different viewpoint throughout the show (the invitation being ever so gentle, you could feel free to decline and they would move on to someone else). But then, they never did anything to engage that person, and the person wasn’t getting a radically different perspective from anyone else in the audience. So, why? Often a person would be left stranded in the chair for more than one number. Unfortunate choreographic choices - Once, two women were performing for a male audience member who had been placed in the chair upstage, so he was facing the audience the whole time, and the two dancers were approaching him via dance moves, competing for his attention. We were getting their backs, but we got the point of the choreography from that angle. Then, they played the same music again, turned the dancers around and had them approach us, doing the exact same choreography again. Honestly, we got it the first time. You’re good dancers, even from behind. There’s no need to do it again. Also, two women fighting over the same man? Really? And it was all set to a recognizable music selection from the opera Carmen, which also seems, well, unfortunate. Unfortunate music choices - Continuing in that vein, for one number, we got a piece of classical music that was, like Carmen, also immediately recognizable - unfortunately, it was recognizable because it’s been so overused in a series of commercials that when you hear it, you immediately think of a jewelry store. Then there was the female cover version of "The Rainbow Connection," best known as a solo by Kermit The Frog from The Muppet Movie. Then there was the selection “If You Want Me” from the soundtrack of the movie Once - and the choreography to accompany it consisted largely of a man pursuing a woman who kept very pointedly running away from him (dude, take a hint). Overall, throughout the work, there was a preoccupation with that red balloon high above their heads. But then at times, they seemed instead to be preoccupied with one of their downlights - also high above their heads but unconnected. So, what’s the focus, and what does it mean? Every piece in the program had a name that could be connected to science, just like the title of the show itself - Dark Matter, the Anthropic Principle, Origin, Celestial, Anti-Gravity, Entropy, etc. For something with that specific a mission statement, the show itself, and a lot of the pieces within it seemed curiously vague. Again, nothing wrong with the dancers in Theory of Relativity. It’s the material they’re working with. And I just keep harkening back to those opening minutes of promise. And wishing John Munger were still here to share it with.